Morning ladies & happy Monday. Following my recent trip to Paris, I'm obsessed with how the Parisians dress. Everywhere I looked I kept seeing oh so stylish ladies in timeless classics that had a certain je ne sais quoi, which looked so effortless. So when Marks & Spencer recently asked me to collaborate on a new post, I thought it perfect timing to showcase those timeless classics that Marks get so right, that would be perfect for starting to recreate that Parisian flair. So let's get started on my top ten picks, all from their latest new in collection that if you've not recently taken a peek has some great pieces. 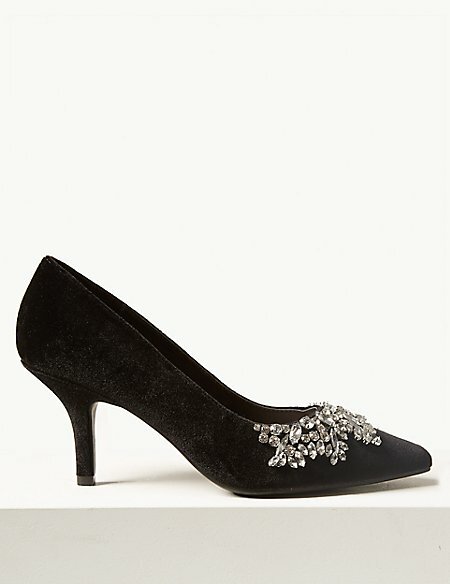 Starting with the above statement embellished court shoes, which I just love. Not to high a heel, timeless in design but with that added bit of bling to add interest, that will also satisfy any of our inner magpies. Style with a cropped pair of cigarette pants & a simple silk shirt (see here) or even with an oversized white shirt, like the one featured a little later on in the post paired with jeans like these & you've got a perfect stylish laid back look. 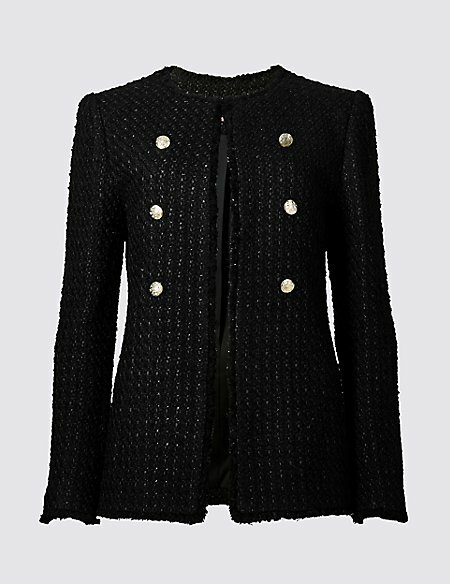 Now the above jacket has a real air of Chanel but on a much more purse friendly budget & again can easily be dressed up or down, or even worn to the office. I'd team the boucle jacket with the above timeless satin camisole & depending on the occasion style with jeans & a pair of heels, or leather leggings & a white shirt like the one below together with the embellished court shoes at the start of the post. 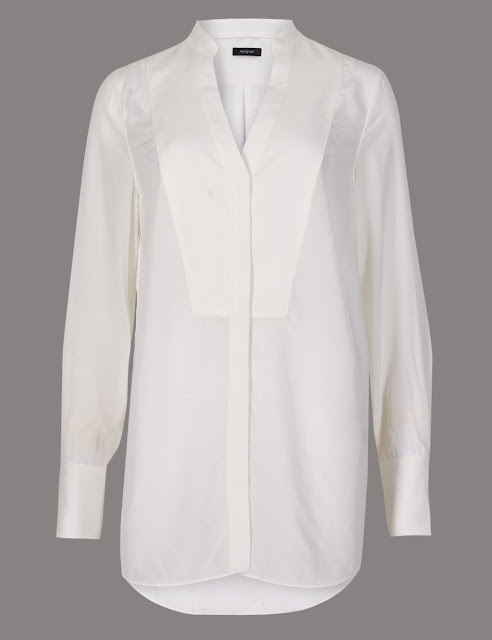 Of course an oversized white shirt is the ultimate in understated style. 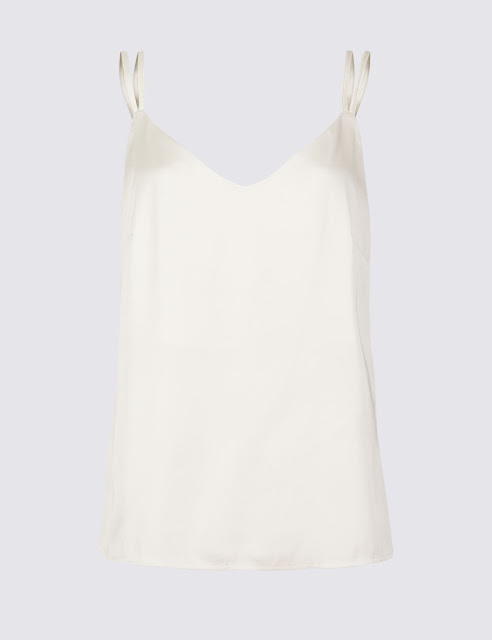 Ideal for wearing with boyfriend jeans & court shoes, or trainers & leather leggings. As well as being perfect for pairing with a lace/embellished pencil skirt like this one or even cigarette pants. In terms of jewellery I'd either team with a statement necklace or some delicate fine chain layered necklaces. 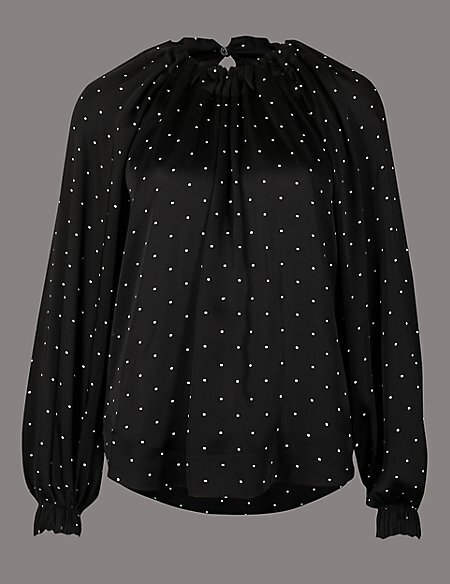 Similarly the above statement polka dot blouse would look great styled with leather leggings or jeans. The pleated cuff & collar add that extra detailing to help elevate it from all the other polka dot blouses around & it even has a gorgeous tie neck at the back. I'm really feeling the love for leather leggings this season, but if you don't want to pay the price of leather ones these faux leather ones would be perfect. Wear with trainers/ankle boots & an oversized knit or style as shown above with Marks' checked single breasted coat paired with their pure cashmere roll neck jumper & Jewel Trim Square Toe Loafers. With the arrival of Autumn knitwear is a most & as much as I'm a lover of Mark's cashmere, I've really fallen for this more chunky, boxy cropped cardi that I think would look great teamed with a floral maxi dress, such as this one. Although I'm equally loving how Marks have styled it above with their round neck ¾ sleeve longline t-shirt, slim leg ankle grazer trousers & wide fit metal trim loafers. Now one item that may not necessarily conjure up the image of timeless classics is a leopard print coat, but leopard really is a neutral not to mention the print of the season. Making it the perfect time to invest if you've been tempted in the past. 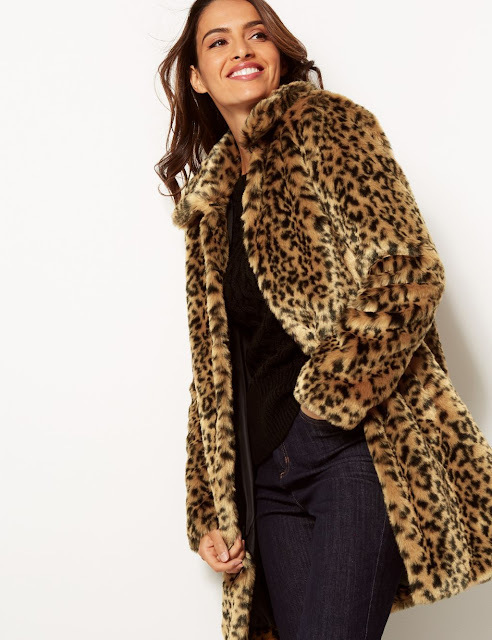 I know before I took the plunge this style of coat was always something I admired from a far thinking I wouldn't have the nerve to wear one out but if you keep the rest of your look timeless & classic it really does look great. For effortless style, not to mention an item you can just throw on when time is short, it the ever useful maxi dress. I'm just loving the colour of the one above & think it would look great teamed with a belt like this one & these ankle boots. The wear with a biker jacket or blazer, or come winter a tailored ¾ coat such as this one. 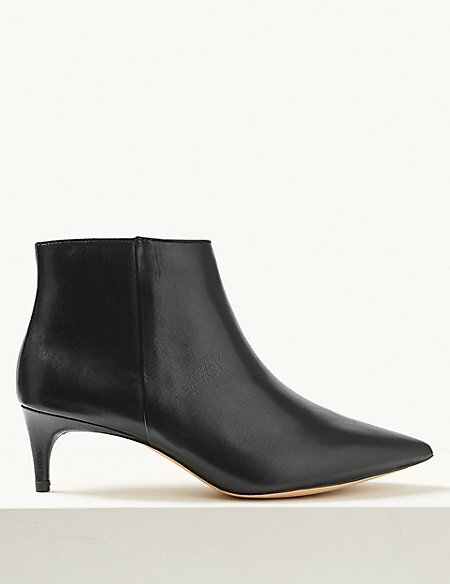 And finally how about these dress up or down kitten heel ankle boots. Just an elegant, timeless classic that will work with most looks. Talking of timeless classics, today's look is all about the biker jacket. Which I've teamed with a simple maxi dress. 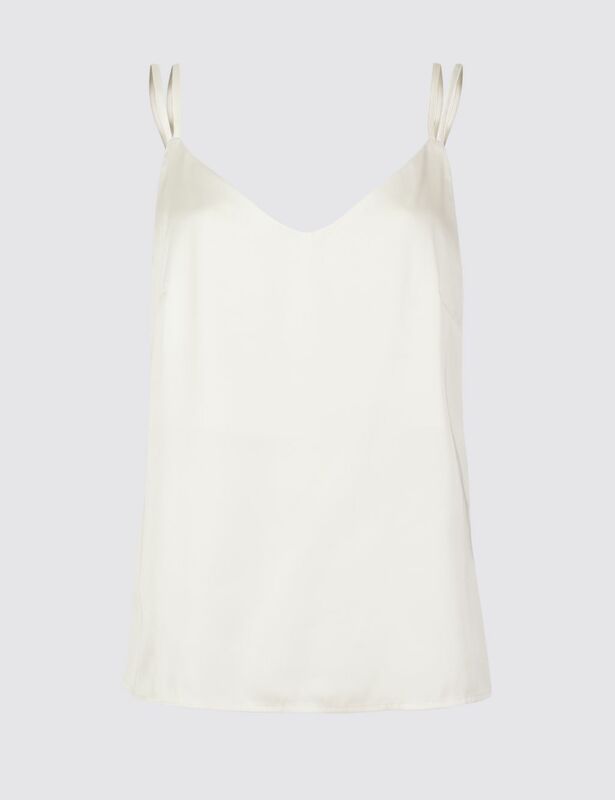 The perfect look for just grabbing out the wardrobe & getting on with the day. Right lots to do today so I'd better get on but don't forget you can check out the full range of Marks' new into store here. I'd love to hear if there's any 'must haves' that have caught your eye. Enjoy your day ladies & as always I'll see you in the morning. Oh & if you fancy the chance to win a £200 Gourmet Guide Restaurant voucher then take a peek here. I've been nominated in the Asquith Adores Blogger Awards for 'Best Over 40 Blogger' & would love it if you could please vote for me here. Every vote entered will be in with a chance to win the voucher so lots of luck!